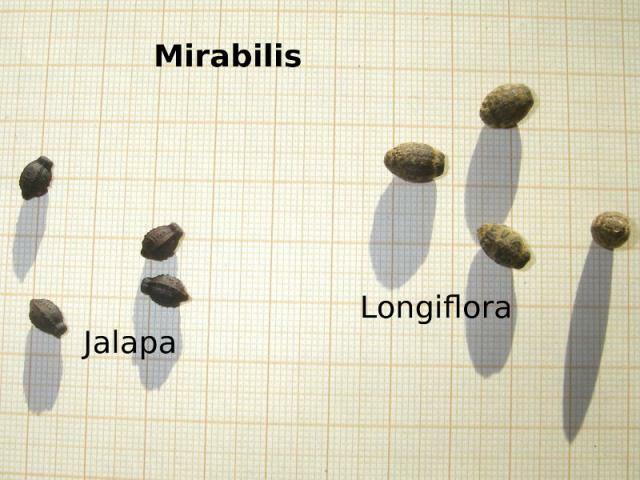 Mirabilis is a genus in the Nyctaginaceae? familiy with about 60 species in six subsections distributed mostly in the Americas. 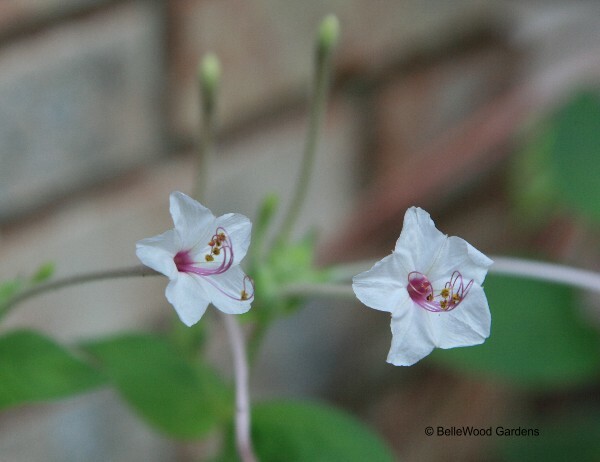 Some Mirabilis form tuberous roots as storage organ for either cold or dry seasons. 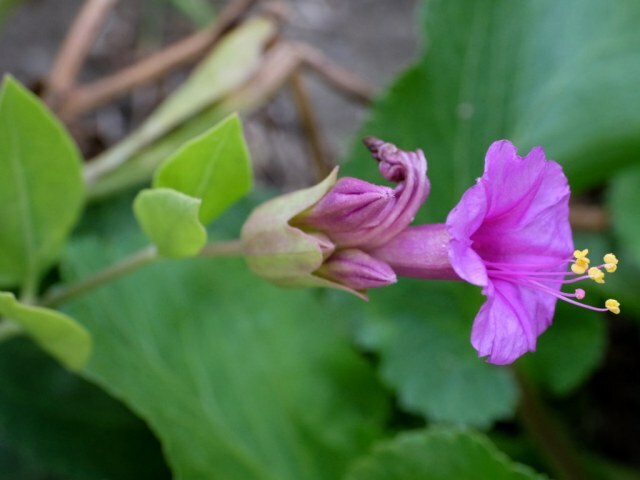 Both the Latin and the English names of the genus are derived from the type species, Mirabilis jalapa. 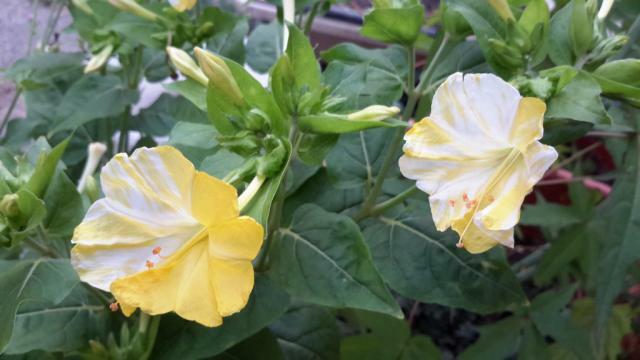 They are called four o'clocks for opening their funnel-shaped flowers in the late afternoon, lasting until the morning of the next day. 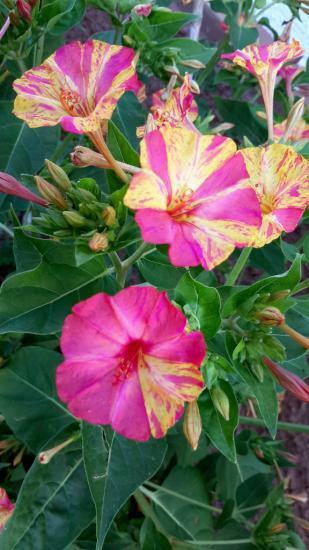 The Latin Mirabilis refers to the "miracle" of having flowers of different colors on the same plant in some of the "broken colors"-forms. Mirabilis jalapa is among the most colorful of the genus. Since it was already cultivated by the Aztecs, both its origin and true natural form are somewhat unclear. The epithet Jalapa may refer to the Department in Guatemala or several places in Mexico. M. jalapa was introduced to Europe as an ornamental as early as the middle of the sixteenth century and has naturalized in many, mostly subtropical climates. The base colors are white, yellow and magenta, allowing for any combination of those in an often quite coarse broken color scheme. Plain pink can occur as offspring from magenta and white parents, while orange or salmon forms seem to be produced by a very fine broken colors pattern. Flowers open up in the late afternoon and close in the morning of the following day. 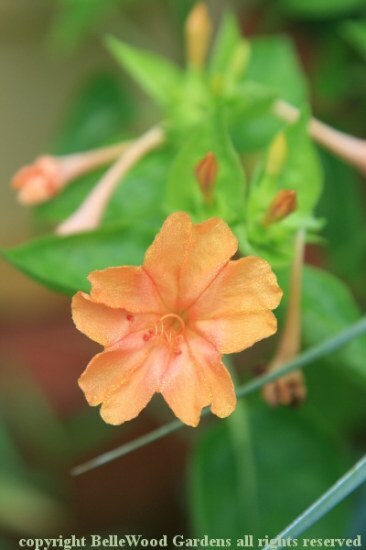 Mirabilis jalapa can be cultivated as an annual in temperate climates, self-seeding readily. Since the seedlings are quite large and easily pulled, they usually do not become too invasive. Alternatively, the tubers can be lifted after the first freezing and tolerate dry, dark winter storage. In Martin Bohnet's zone 7 garden, a few specimens survive outside close to a south-facing wall, protected both from cold and winter wetness. Photos 1-2 by him show two broken color forms. Note the four-fifth pure magenta flower on photo 1. 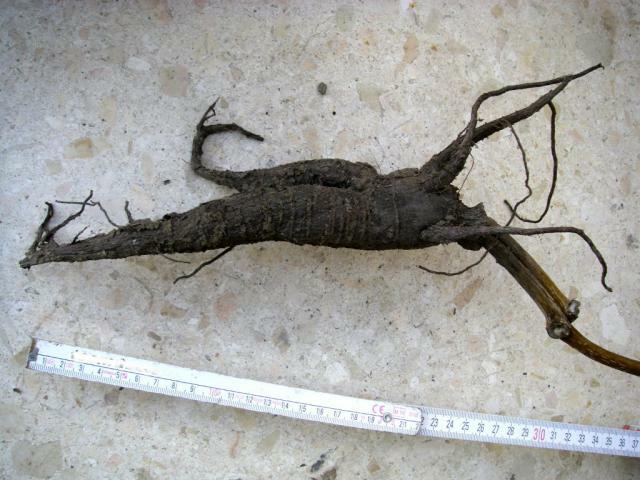 Photo 3 shows the size a tuber may reach in one year in good conditions. The stem has not yet fallen off, but will so as the plant forms a suberised abscission layer at any stem node, including the root neck. Picture 4 shows an unusually colored cultivar "Orange Crush" grown by Judy Glattstein. 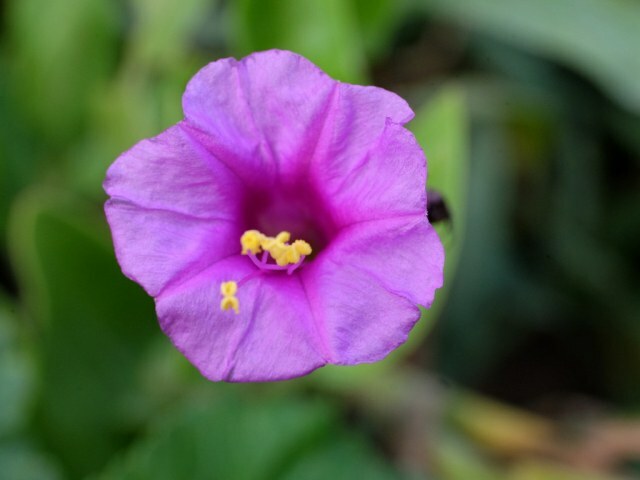 Mirabilis longiflora is native to the southwestern United states and parts of Mexico. Its white flower tubes are up to 17 cm long, open in the afternoon and are strongly scented at night. 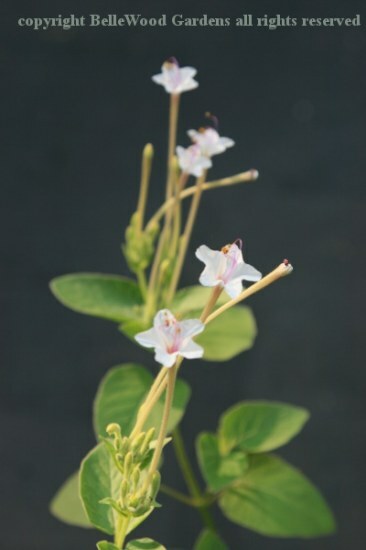 It is closely related to Mirabilis jalapa and can hybridize with it, but only as pollen parent, most likely because of the length of its styles. M. longiflora will not always flower in the first year and has a more sprawling habit than M. jalapa. The first 2 pictures are from Judy Glattstein who grows them in a container, hibernating in her garage in New Jersey. Last photo by Martin Bohnet of seed of the two species on a 1 cm grid. 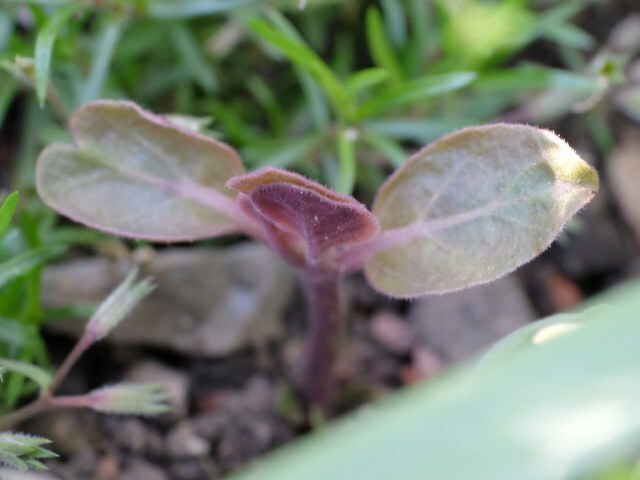 Mirabilis multiflora (Torr.) A. Gray or Colorado Four o'clock is a species native to the south-western states of the USA. Typically for section Quamoclidion it has several of its bright purple flowers per involucre. The somewhat darker throat is notably wider than in Mirabilis jalapa. The sprawling plant has silverish and slightly succulent leaves, as it is adapted to dry, desert-like conditions. The species is among the most hardy of the genus and has survived -15 °C with only minor snow cover in southern Germany. You need to be patient in spring, as it doesn't emerge before early May.